Last night I got home and I was wishing for something magical. I couldn’t quite place exactly what it is I wanted so as you can imagine; It was a bit of a difficult riddle to solve. So I opened my food cupboard and somehow the Oreo cookies were quite appealing. My daughter on the other hand was screaming tirelessly for cupcakes. I was puzzled ! 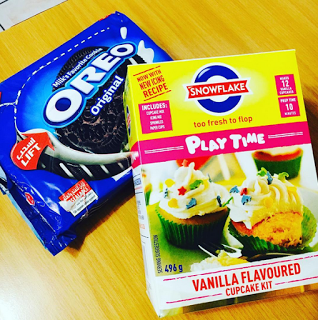 So I grabbed the Snowflake Vanilla Cupcakes pre-mix we had and the Oreo cookies and I said to her, “Let’s make Magic”. With this, we made/baked Vanilla Cupcakes with Oreo cookies flavoured frosting. See below for Ingredients and Method. Now that you have your ingredients lined up, you are a step closer to making MAGIC. Here’s the directions for mixing the ingredients all together. 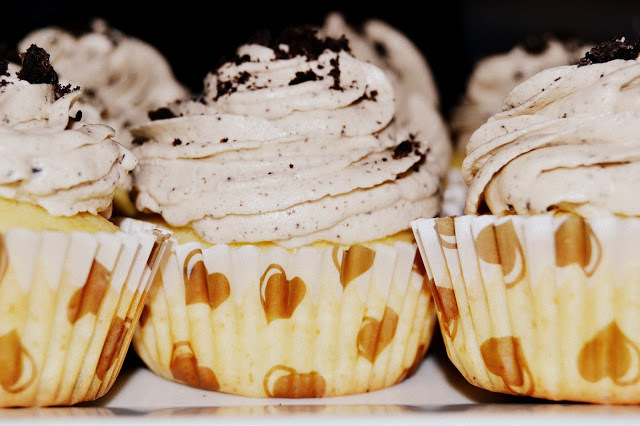 If you do not have a premix, mix the ingredients you have for the cupcakes until you have a smooth consistent batter. Make sure you do not over mix. If you are using the Premix, follow the instructions as outlined on the pack. For this pack that I used(Vanilla Cupcakes), mix egg, Oil, and Milk together in a large bowl. Then add your Cupcake mix to the mixture and continue to mix until it is well combined. Make sure you do not over mix. 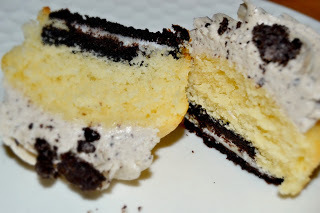 Line your cupcake pan with Cupcake cases and in each, put in 1 Oreo cookie at the bottom. Then fill the cupcake cases to 3/4 with the batter and bake for +/- 15min or until baked through. Once cooked, remove from oven then set them aside on the cooling rack until they are completely cooled down. While that is baking, you can start with the Frosting. In a bowl beat together butter and Icing sugar until it forms bread crumbs consistency. Add the Crushed Oreo cookies and continue to mix. Then add your milk [and vanilla Essence] and continue to mix. Ensure that all the ingredients are combined together. Depending on your desired consistency, you can either add more milk to make it loose or more icing sugar to make it thicker. Then continue to mix. Once you have all the ingredients in and you are happy with the consistency, you can mix the frosting for an extra 1min on full speed for the creamy texture (this is what I like to do). Then transfer to a pipping bag and wait for your cupcakes to cool down. Once the Cupcakes have cooled down completely, you can go ahead and frost them. Then enjoy them with a cup of tea, coffee. Or anything you prefer really :). Thank you so much for stopping by and I’ll see you soon.